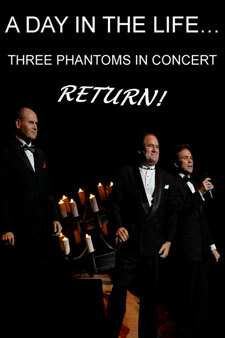 Completely different from the original Three Phantoms In Concert program! Designed as a follow-up to the original program, this time around the Phantoms take your audience on a humorous journey illustrating “a day in the life” of a Broadway star. In this fully-scripted program, the Phantoms are put through their paces in various Broadway “audition” scenarios, the Phantoms examine competition for roles, egos, career choices and share extraordinary personal stories of memorable auditions with your audience. The new program includes twenty-two passion-filled songs, representing eighteen Broadway shows including “Chicago”, “South Pacific”, “Cats”, “Guys & Dolls”, “Jesus Christ Superstar”, “The Music Man”, “Les Misérables”, “Annie Get Your Gun”, “Chess”, “Miss Saigon” and of course, “The Phantom Of The Opera”. Musical arrangements arrive in folders in show order ready to be placed directly on music stands. This program is available for full orchestra, six-piece ensemble or piano accompaniment. THREE-MENDOUS: “A DAY IN THE LIFE: Three Phantoms In Concert Return!”, the theatrical spectacle with the ample skills of Craig Schulman, Cris Groenendaal and Kevin Gray, earned three standing ovations at last Friday’s [world] premiere at the Hawai’i Theatre – and I assume the Saturday and Sunday audiences responded similarly. What wonderment – carefully selected tunes that matched the three different Phantom “types,” the diversity only enhancing the show, with a concept of what it’s like to be an actor. In solo, duo or trio configuration, the “Phantoms” revue defined the caliber of professionalism – and repeatedly demonstrated the trio’s camaraderie. Solo sizzlers? Gray’s “Gethsemane,” the under-appreciated and rarely-sung “Jesus Christ Superstar” tune, and “Anthem,” the stirring favorite from “Chess” were wildly applauded, as were Schulman’s signature “Bring Him Home” from “Les Misérables” (still a tear-jerker) and “Why God Why?” the anguish-laced melody from “Miss Saigon.” Ditto, Groenendaal’s “Send in the Clowns” from his Stephen Sondheim repertoire (this, from “A Little Night Music”) and “Mr. Cellophane,” the “Chicago” smoothie that is everything but transparent. “Music of the Night” was the centerpiece, tapping all three voices… enhanced the prevailing intimacy and inspiration from the vocal trio. From start to finish, the show had unexpected thrills and vistas of bygone stage shows – with the three voices as scenic paintbrushes. In short, three-mendous!